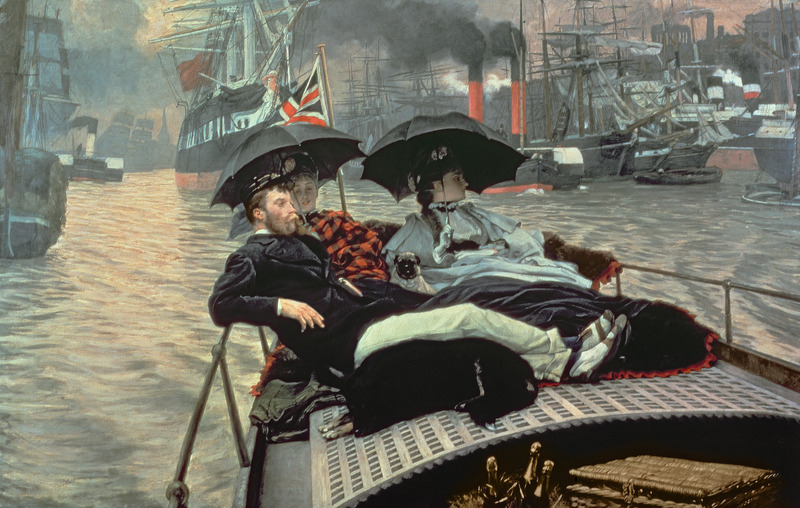 Interest in the work of James Tissot has grown steadily over the decades of the twentieth century and has culminated in numerous exhibitions and loans of his paintings since 2000. The most recent retrospective of James Tissot’s work in North America, and the only one since the first in 1968 (in Rhode Island and Toronto), was James Tissot: Victorian Life/Modern Love, a traveling exhibition with the support of the Federal Council on the Arts and the Humanities, at the Yale Center for British Art, New Haven, Connecticut, September 22 – November 28, 1999; the Musée du Québec, Canada, December 15, 1999 – March 12, 2000; and the Albright-Knox Gallery, Buffalo, New York, March 24 – July 2, 2000. The exhibition featured approximately forty paintings, forty prints and twenty watercolors selected from public and private collections in North America, Europe and Australia, including works from the Tate Gallery in London, the Musée d’Orsay in Paris and the National Gallery of Art in Washington, D.C. 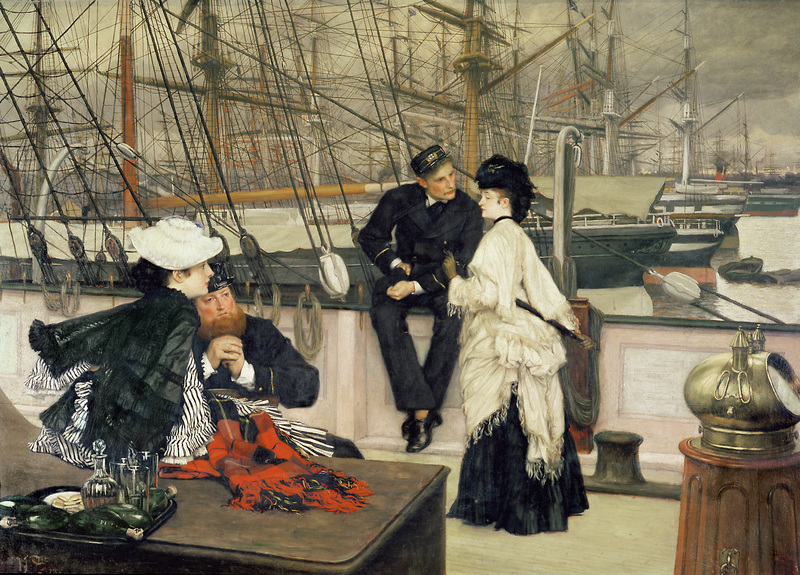 In New Haven, on display for the first time in the U.S. was Tissot’s The Hammock (1879), owned then by American stockbroker Jerome Davis of Greenwich, Connecticut. In the late 1990s, there was a booming market for Pre-Raphaelite art, driven by four wealthy collectors: British musical composer Sir Andrew Lloyd Webber, Anglo-Bolivian tin heiress Isabel Goldsmith, U.S. stockbroker Jerome Davis and Dutch-born Australian cleaning and security services magnate John Schaeffer. Prices peaked in June, 2000 when Lloyd Webber paid £ 6.6 million with fees – then the second-highest price ever for a British work of art – for John William Waterhouse’s St. Cecilia (1895). The four collectors subsequently became less active, and contemporary art began to dominate the auction houses. James Tissot et ses maîtres, a retrospective exhibition curated by Cyrille Sciama at the Musée des beaux-arts, Nantes, France, from November 4, 2005 to February 5, 2006, brought together twenty paintings and eight engravings and explored Tissot’s work in relation to his teachers and contemporaries, including Jean-Auguste-Dominique Ingres (1780 – 1867), Jean-Hippolyte Flandrin (1809 – 1864), Louis Lamothe (1822 – 1869), Alfred Stevens (1823 – 1906), and Edgar Degas (1834 – 1917), as well as Tissot’s influence on a younger generation of painters and printmakers including Paul Helleu (1859 –1927). 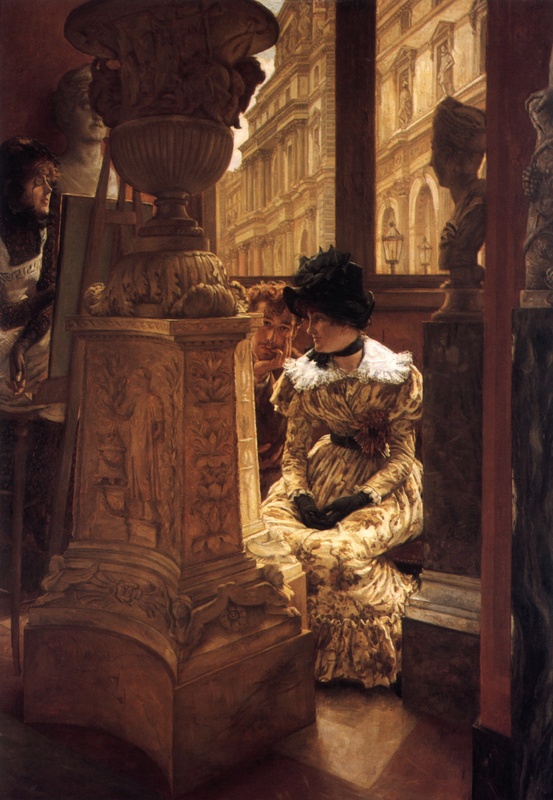 A featured oil painting was Tissot’s Quiet (c. 1878/79), which depicts Tissot’s young mistress and muse, Kathleen Newton (1854 – 1882). Juan Antonio Pérez Simón (b. 1941) is a Spanish telecommunications billionaire and naturalized Mexican citizen who has the largest private art collection in the world. His interest in art began as a teenager, and he began collecting in his early 20s, when he bought two prints at the Prado Museum in Madrid. In the 1970s, he and his wife, Josefina, haggled in the streets for their first original oil paintings – two Mexican landscape paintings for a few pesos – when they had so little money that their flat was unfurnished except for a bed. He now owns over 3,000 paintings representing artists from fourteenth-century Italy and the German Renaissance to El Greco, Rubens, Canaletto, Goya, Pissarro, Monet, Renoir, Van Gogh, Gauguin, Cézanne, and Dalí. He plans to leave them to a museum to be built in Mexico City, but many of the paintings normally hang in Pérez Simón’s six homes. He loans individual pieces to museums around the world but had not shown works from his collection together until the Thyssen-Bornemisza Museum in Madrid presented fifty-seven of his paintings, which traveled outside of Mexico for the first time, in From Cranach to Monet: Masterpieces from the Pérez Simón Collection, June 20 to September 10, 2006. Two rooms were dedicated to Victorian artists, whose work is not well represented in Spain, including Dante Gabriel Rossetti’s Venus Verticordia, John William Waterhouse’s The Ball Glass, and James Tissot’s Spring (c. 1878), which also depicts Kathleen Newton. 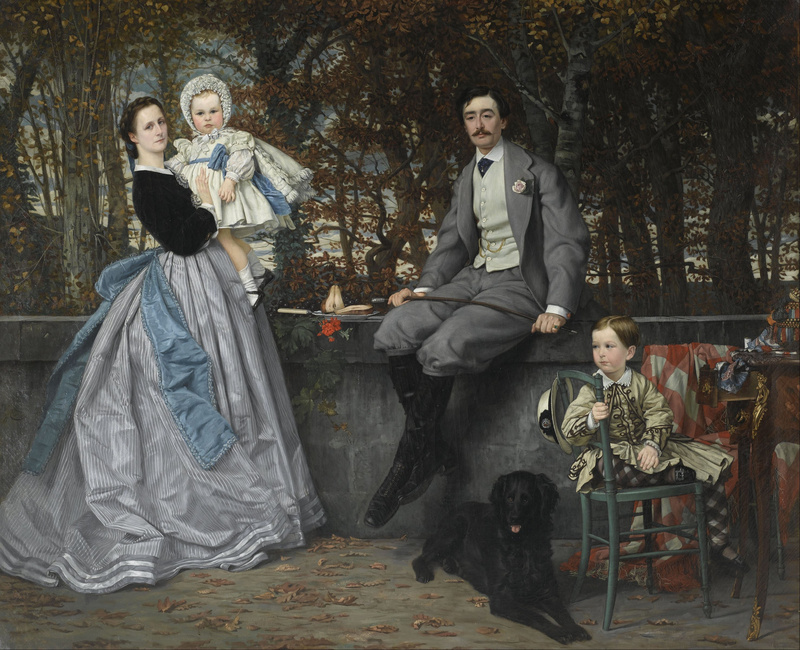 Pérez Simón also has the largest private collection of Victorian art outside Great Britain, and he has shared fifty-two paintings for the exhibition, A Victorian Obsession: The Pérez Simón Collection, November 14, 2014 to March 29, 2015 at the Leighton House Museum in London, the first time these pictures have been exhibited together in the U.K. Unfortunately, Tissot’s Spring is not included in this exhibition. Daniel Robbins, curator of the Leighton House, said that Pérez Simón “buys what he loves and he has been buying these pictures – often highly decorative and featuring beautiful women – since they were very much out of fashion. I think people in the art world didn’t quite put it together and work out where they were all going.” That’s because Pérez Simón has assembled his collection so quietly. The good news is, he claims that he never refuses to loan a work, so perhaps the public will have the opportunity to see Spring again. 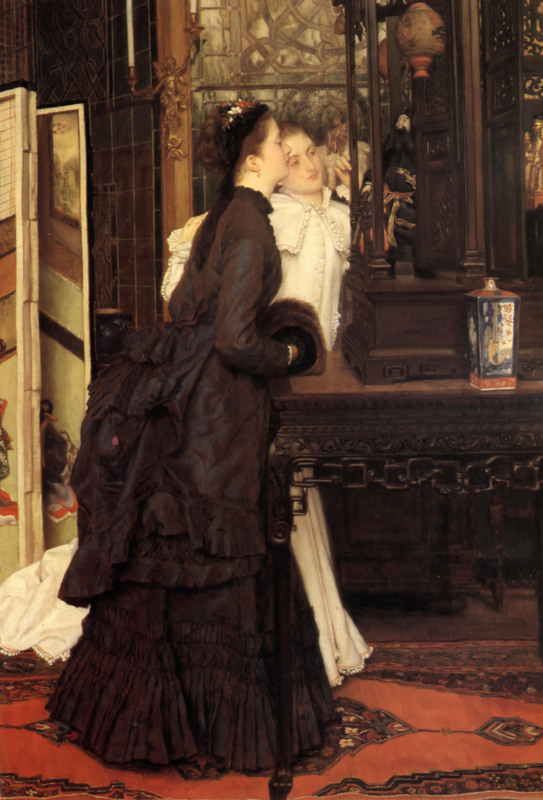 And he continues to purchase paintings, so perhaps he will collect more of Tissot’s work. 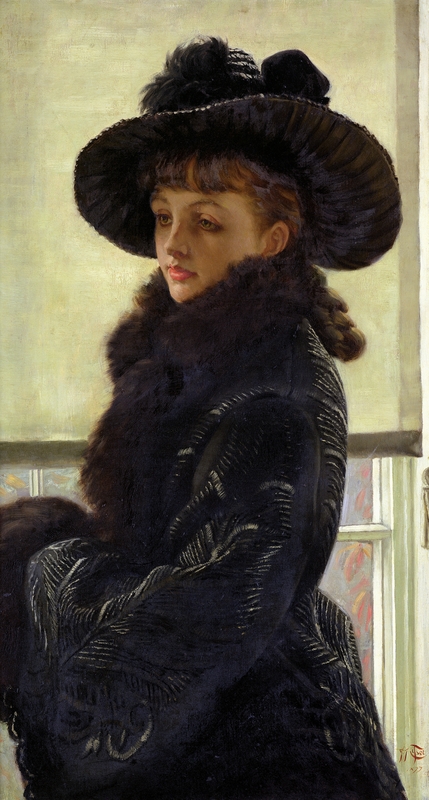 Tissot’s 1877 painting, Mavourneen (Portrait of Kathleen Newton), in which Mrs. Newton wears the same ensemble as she does in October (1877), was exhibited at the Delaware Art Museum in Wilmington from November 28, 2006, through March 30, 2007. The painting had been in a private collection in Australia before it was purchased by Theodore Bruce, Adelaide, at Christie’s in 1984. By the next year, it was with the Owen Edgar Gallery, London. In 1995, it was sold to an American collector at Christie’s, New York for $ 2,300,000/£ 1,433,915. Kathleen Mavourneen was a popular love song during Tissot’s years in London (“mavourneen” means “my darling”), as well as a play by William Travers, which enjoyed a revival at the Globe Theatre in July, 1876. From June 13 to September 6, 2009, In the Louvre (1884) was displayed at the Bruce Museum in Greenwich, Connecticut with Masterpieces of European Painting from Museo de Arte de Ponce in Puerto Rico, a premier institution of Italian Baroque, Spanish, Flemish, French Academic, and British 19th-century art founded by Puerto Rican industrialist Luis A. Ferré (1904 – 2003). Ferré had traveled to Europe in 1956 and acquired art including many Pre-Raphaelite works. On January 3, 1959, with seventy-two works of art, Ferré opened an art museum in a small wooden house in his birthplace of Ponce. 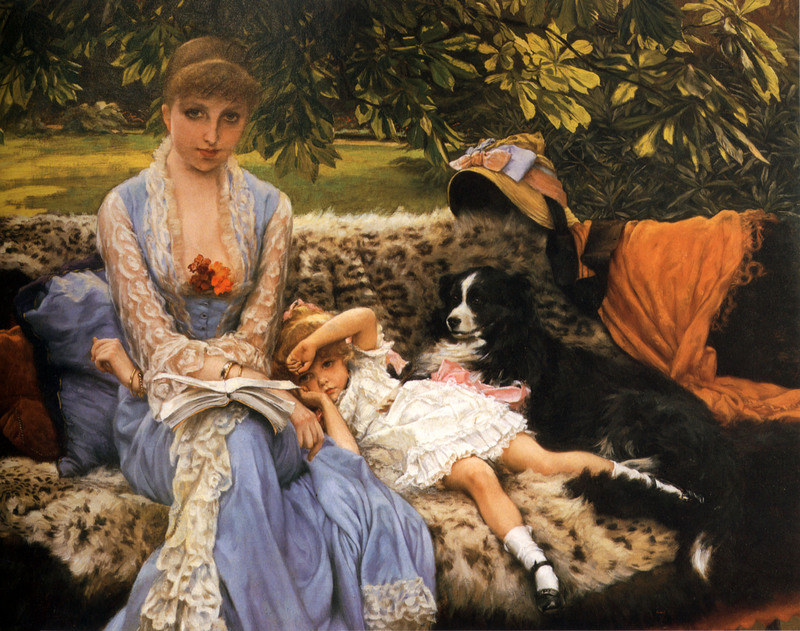 Tissot’s In the Louvre (L’Esthetique, 1883–1885) was purchased at Sotheby’s, London in April, 1959 for $ 2,099/£ 750 for the Ponce’s renowned collection of Pre-Raphaelite and Victorian art. The permanent building, designed by modernist Edward Durrell Stone, was opened in 1962. At the time of the exhibition at the Bruce Museum in 2009, the Museo de Arte de Ponce was under renovation. Tissot’s Young Ladies Admiring Japanese Objects (1869) has been on loan to the J. Paul Getty Museum in California from a private collection since about 2012. A major show of twelve of James Tissot’s oil paintings occurred, unheralded, about two years ago, buried in Impressionism, Fashion & Modernity, which opened at the Musée d’Orsay, Paris, from September 25, 2012 to January 20, 2013, traveled to The Metropolitan Museum of Art, New York from February 26 to May 27 and closed at The Art Institute of Chicago from June 26 to September 22. The blockbuster exhibition was billed as “A revealing look at the role of fashion in the works of the Impressionists and their contemporaries. Some eighty major figure paintings, seen in concert with period costumes, accessories, fashion plates, photographs, and popular prints, will highlight the vital relationship between fashion and art during the pivotal years, from the mid-1860s to the mid-1880s, when Paris emerged as the style capital of the world.” I attended this show at the Met in May, and I can tell you that dense crowds formed around Tissot’s paintings, particularly The Marquis and the Marquise de Miramon and their Children (1865) [the portrait remained in the family until 2006, when it was acquired by the Musée d’Orsay, and this was the first time it had been exhibited anywhere else since 1866]; Portrait of the Marquise de Miramon, née, Thérèse Feuillant (1866) [on loan from The J. Paul Getty Museum, in Los Angeles, California, which acquired the picture from the family in 2007]; and The Circle of the Rue Royale, which filled a wall at the Met [the Musée d’Orsay acquired this painting in 2011 from one of the twelve sitters’ descendants for about 4 million euros]. Tissot’s paintings, inexplicably, were not publicized with the exhibition, yet I had to jostle through the crowd of admirers to view them close-up. They were, quite literally, showstoppers. From March 28 to November 3, 2013, The Hepworth Wakefield, West Yorkshire, U.K., presented James Tissot: Painting the Victorian Woman: “Taking the much cherished painting On the Thames, 1876, from our collection as a starting point, this new collection display explores the representation of women in the work of French-born artist, James Tissot (1836 – 1902).” The exhibition also featured loans, from the Tate and several regional art galleries, of works including The Gallery of HMS Calcutta (c. 1876) and Portsmouth Dockyard (1877), to discuss the portrayal of Victorian femininity in relation to Tissot’s life history and the contrasting roles of women in the region’s coal industry. There are no current or upcoming Tissot exhibitions, but since the last Tissot retrospective was in 2005–2006, perhaps the next one isn’t too far off. UPDATE as of October 2018 – A major retrospective of James Tissot’s work will be held in 2019 and 2020: James Tissot, 1836-1902, co-organized by The Fine Arts Museums of San Francisco and the Musées d’Orsay et de l’Orangerie. I’m looking forward to it, and I hope to be invited to contribute some of the extensive new scholarship I have to offer on James Tissot’s life and work. 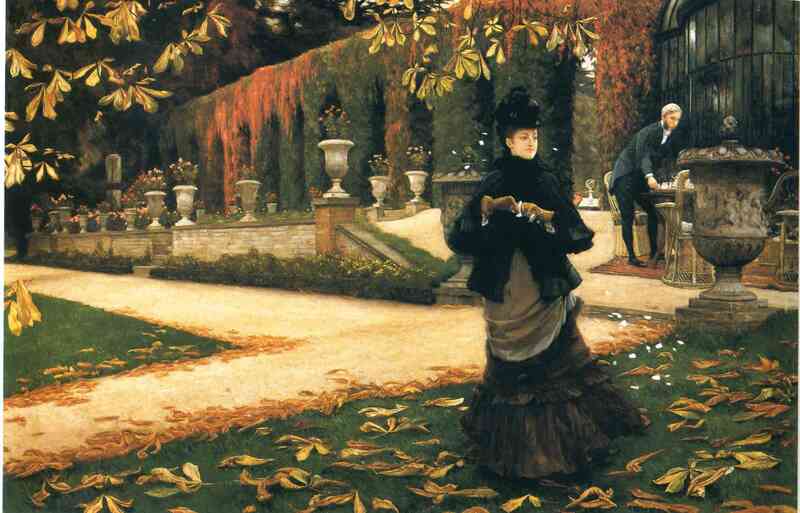 This entry was posted in Art blog, Art History, Impressionists and tagged Andrew Lloyd Webber, James Tissot, Juan Antonio Pérez Simón on January 16, 2015 by Lucy Paquette, author of The Hammock: A novel based on the true story of French painter James Tissot. I don’t think I’ve encountered Tissot’s work before. Although I’ve done artwork all my life, I wasn’t an art student, so I’ve been educating myself in art history in fits and starts in recent years. From wonderful representational pieces like these all the way to abstract art. Better late than never. Thanks for showcasing these works.